Our bodies are composed of water more than any other substance. In fact, when we were in our mother’s womb we were 99 per cent water. Our blood is 90 per cent water and our heart is 79 per cent water. Every structure of our body and every chemical process necessary for life depends on water. So why would we not want to drink the cleanest, most beneficial water for our bodies? Tim Larkin of First Glass Design believes that we should do all we can to quench our body’s thirst with the best water we can find. He is so passionate about what we drink that he has developed a water bottle that he believes can make the best water even better. Inspired by the work of Dr. Masaru Emoto, Larkin creates unique pieces of functional art with water in mind. Specifically, Larkin etches prayers and other positive images onto the outside of Miron glass water bottles as a way of enriching the water inside. 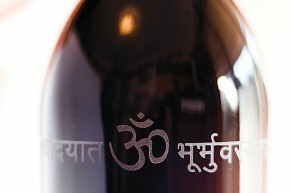 He believes that the positive messages and images have a vibration that is beneficial to what is stored inside the bottle. This positively charged water is then absorbed by our body—and Larkin believes that we are better for it. Though Larkin’s ideas are cutting edge, he currently sells his beautiful and functional bottles to customers the world over—and he can barely keep up with the steady demand. Initially, etching glass was a painstaking process. “I bought a set of glasses that I planned to etch for my girlfriend as a gift,” he recalls. “It ended up taking me much longer than I anticipated as I had to cut each stencil by hand.” Eventually, Larkin invested in a vinyl cutting machine, which allowed him to create stencils with much greater ease. Larkin believes these positive images have a demonstrative effect on the water that is stored inside. “I believe that the positive vibrations created by my images actually create what is called structured water,” he says. The idea of structured water was pioneered by Dr. Emoto of Japan. “Dr. Emoto’s research postulates that prayer has a visible effect on the structure of water, which means that water molecules link together to form complex geometrical shapes—shapes which are visible as crystals,” explains Larkin. According to Dr. Emoto, human thought and intent has a direct observable effect on the structural formation of ice crystals. To support his hypothesis, Dr. Emoto took pictures of water that had been subjected to both positive and negative words and thoughts. He published a book, The Hidden Messages in Water, which contains pictures of what he found. According to Dr. Emoto, the water subjected to positive words—such as thank you—consistently formed beautiful crystals. Those subjected to hateful thoughts and words could not form crystals at all. In his book, Dr. Emoto further explains that the structure and amount of detail of an ice crystal is also an indicator of the water quality. According to Dr. Emoto, high quality water, such as that from a pure mountain stream, forms beautiful and intricate crystals, while low quality or polluted water has difficulty forming crystals. According to Larkin, the molecular structure of water and its unique physical properties give it the quality of being an incredibly adaptable carrier of information. This belief is not new, however. Homeopathic medicine, for example, is based on the ability of water to store vibrational energy. Larkin now believes that everything we experience—what we choose to watch on television, who we choose to spend our time, and even our thoughts—affects our physical, mental and spiritual well-being in the end. Miron glass is an antioxidant glass that works essentially like a natural filter. Traditional glass colors such as clear or amber allow light from the visible spectrum to pass through, but Miron glass is something new altogether. Developed by Swiss scientist Yves Kraushaar after 14 years of research, Miron glass is scientifically proven to retard the growth of pathogenic materials. It only allows the passage of the three frequencies of light known to nurture and protect all organic matter—visible violet light, non visible UVA and far infrared light. Non visible UVA is responsible for retarding the growth of bacteria, mould and other pathogens. This keeps water fresh and vital for years. Even raw eggs and crushed fruit stored in Miron glass stay fresh for weeks. Furthermore, violet light has the highest vibration frequency (720 – 770 billion Hertz) of all colors, and it corresponds exactly to the vibration of our central nervous system. Essentially, Miron glass is shown to not only preserve the contents held within, but it can actually make it better over time.